Do you have an emergency plan? A sturdy box - to hold all of the supplies. The box must be easy to carry and pack, and is able to hold the complete kit. And I want it red. A muzzle - because even loving, well-trained animals may bite when injured or afraid. Tweezers - to remove splinters, or other foreign materials from wounds. Scissors - for cutting out things matted in fur or freeing pets from entanglements. Saline Solution - to clean out wounds and flush the eyes. Thermometer and small jar of Vaseline - to check temperature. The normal temperature for dogs is between 100.0 – 102.5 degrees Fahrenheit. Tape - 1" white medical tape is easy to tear off and holds well. Roll Gauze - is used for bandaging, an aid to stop bleeding, and padding for splints. Telfa pads - are non-stick dressings for bandaging a wound. Vet Wrap - is used over a telfa pad or roll gauze. It clings to itself and is semi-watertight. Caution: do not wrap this too tight. QuikClot or something similar - to stop bleeding (wounds). Antiseptic wash or wipes - I need to look for non-stinging preparations such as chlorhexidine or betadine. Rubbing alcohol is not good for open sores or wounds. Antibiotic ointment - Look for an over-the-counter "general purpose" antibiotic ointment for light use with minor skin wounds. Toenail trimmer and styptic pencil for torn toenails. Hydrogen Peroxide and a plastic syringe - Hydrogen peroxide is an emetic which induces vomiting. Only use this emetic when warranted, such as if a veterinarian or poison control center says to immediately administer it. Dogs should receive 5 – 25 cc of hydrogen peroxide (orally) for every 10 pounds of weight. If vomiting does not occur in 15 minutes repeat the dose. Small flashlight - can be used to check for any injuries within the mouth or any objects or materials that could be blocking respiration in the upper part of the throat. Vet-prescribed pain relief (NSAID) - I need to speak to my vet about obtaining some as-needed pain relievers for the first aid kit. Diphenhydramine (aka Benadryl) - used for stings and allergic reactions. Cold Packs - can be stowed in an emergency kit and will change temperature when broken or shaken. Can be used to cool down skin after a burn or in case of heatstroke. Remember: always use a cloth between the pack and skin and check frequently for redness or irritation. Emergency Heat Blanket - should be used if an animal’s temperature is decreasing due to shock or exposure. 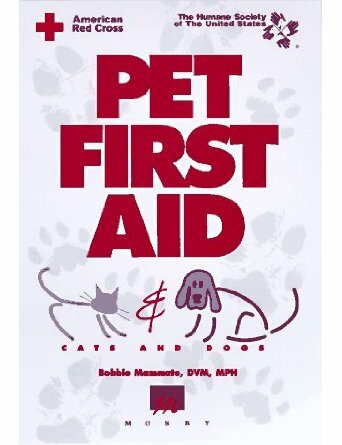 A list of phone numbers - which includes my regular vet, the emergency vet, animal control, and animal poison control numbers. How about you? 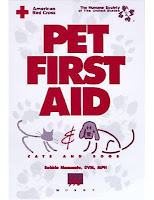 Do you feel the need to make your own pet first aid kit now too? Can you think of anything I have missed? P.S. Just after I posted, I was sent a related link about Dog Emergency & Disaster Preparedness. Check it out!